Ventilated clothing lockers for drying and storing belongings are available for free for people who take alternative transportation at least once a week. Lockers are assigned at the Parking Services office. Bicycle commuters can use the showers at the CRC to clean up. Currently enrolled students can use the CRC for free with student ID. A shower room with lockers are also available on the bottom floor of Lab I. To sign up for a commuter locker in the shower room call or visit Parking Services in Sem 1 Room 3157, (360) 867-6352. The student-run Bike Shop is located on the first floor of the CAB building. Volunteers are available to help you repair your bike or you can use the Bike Shop tools to do your own repairs. If you need to pump up a tire on campus, two air stations are available: one on Red Square near the Lecture Halls; the other is at Seminar II-B near the CRC. There is also a bike repair station with a hand-pump and tools located just across from the Cafe in Seminar II. Bicycle parking is available outside of nearly every place on campus! Many parking space are covered, too. We encourage you to use a sturdy lock. Locks are available for sale in the Greener Bookstore. You can also check out a bike lock for temporary use, for free at the Library circulation desk. It's free and easy to register your bike at Evergreen. Just bring your bicycle to Police Services. After filling out a quick registration form, they'll place a sticker on your bicycle which will allow it to be returned to you should it ever be stolen and then recovered. 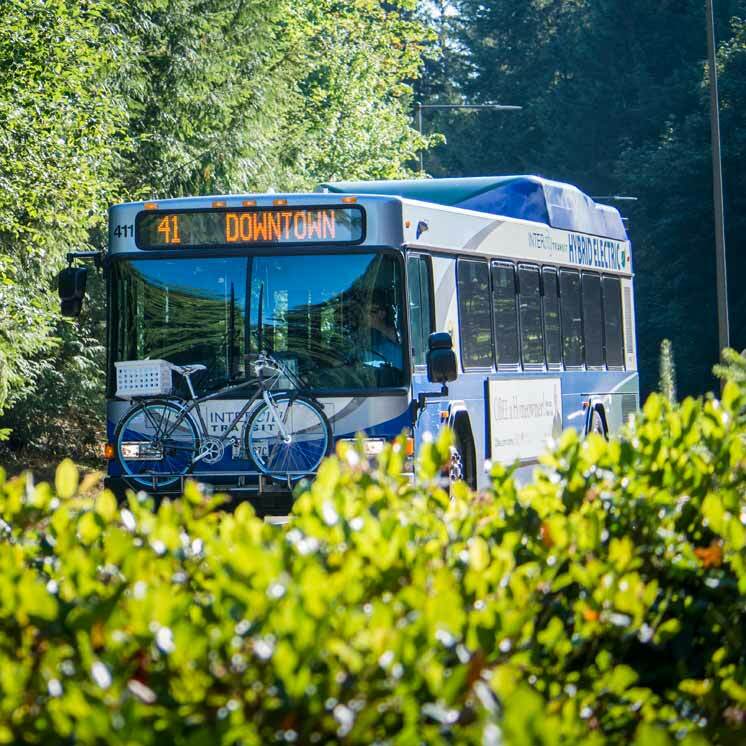 If you like to bike, but the ride to Evergreen is a little too far, try putting your bike on the bus. All Intercity Transit buses have bike racks, with room for two bikes per bus. Find out more on the Intercity Transit website. It's easy to bike around Olympia, with lots of bike lanes, wide shoulders, and trails around town. Check out the county's online bike map to explore your cycling options.